Once again, my mother's Christmas gift to us was to take us - myself, my wife, our 2 children, and my sister - on holiday. Again, our destination was our choice. Following the same thing last year and our holiday to Ibiza, we had the same criteria. Flights from Norwich, our local airport, at reasonable times of the day. This narrowed down the choices to Ibiza again, Mallorca, and Corfu. We decided on Corfu as it would be a bit different again to the Balearics, and neither the children, my mum or sister had been to Greece before. With the onset of the financial crisis, my mum was worried about protests and demonstrations, and how we might cope financially, but I was sure all would be ok, as indeed it was. 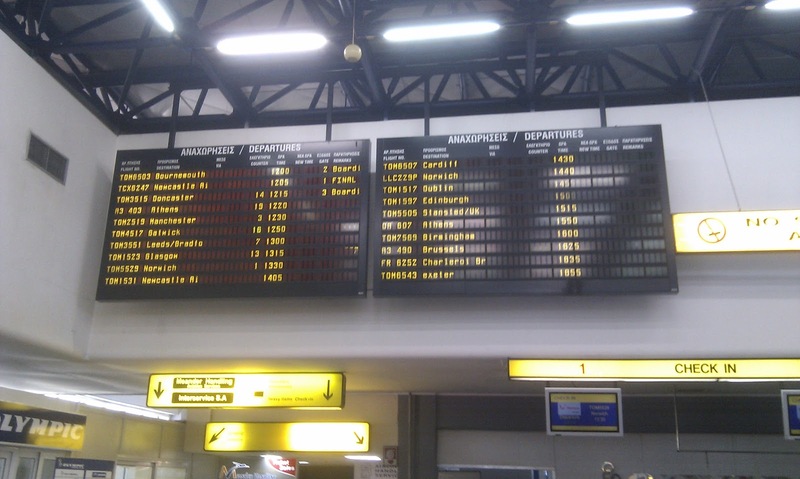 As last year, my mum and sister came to our house, and we took a taxi together the 10 minute drive to the airport. Unlike last year, where we had booked a complete package holiday through Thomson Holidays, this time I booked us on flight only tickets with Thomson, 2 adjacent apartments found through www.holiday-rentals.co.uk, and 2 cars booked from Europcar. We arrived about 2 1/2 hours before departure, mainly to avoid a long queue for checkin and security, which the children can find painful. 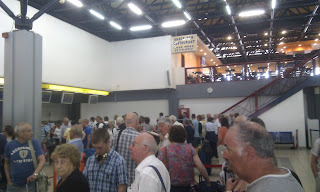 There were 3 checkin desks open for the CFU flight, each was occupied, but we were next in line. Checkin was painless, and our bags weighed and processed. We even managed to be under weight! Next up we paid our "Airport Development Fee" tax and went through security. They were indeed thorough, but soon we were through and had 2 hours before departure. At least from here there was enough to keep the children from being bored. What is this doing here? No services to Spain today. 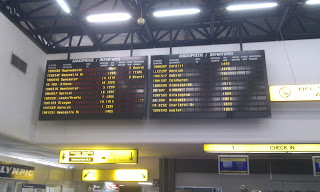 After some looking out of the window, reading some books, and eating some snacks, it was soon time to board. We had seend the incoming aircraft arrive, so knew that it wouldn't be long. There was no pre-boarding of families with children, partly I guess because there were quite a lot of families heading on holiday! Our boarding passes were checked, and we walked through Gate 4 (or rather, door 4 onto the apron) and were directed along the front of the building to the parking stand. Boarding. I had left our pushchair, folded, at the foot of the stairs. W found our seats - we had 21A, B and C for us, and my mum and sister had 22A and B, the row behind. My wife gets quite airsick, so she had the window, and we though it best for Matty to be in the middle, so he wouldn't be able to run around so much. 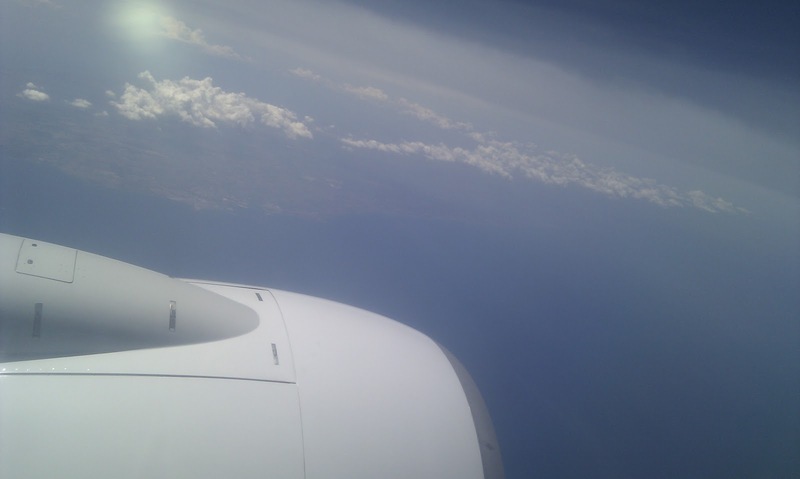 My mum had the window behind, with my sister in the middle seat. She is often afraid of flying, but loves the travel aspect, so she buried herself into her ipod and Kindle until takeoff, and again as soon as electronics could be used again. I handed over my camera to my mum to take some photos out of the window - the aerial outside shots were taken by her. Pushback was on time, and we taxied to the runway and backtracked to the western end. Taxeoff was powerfull, as NWI only has an 1800m runway, and soon we were up into the clear air. A beautiful day for flying. I grew up in the village at the top right of this picture. Since the last year, Thomson Airways has ceased to offer pre-booked airline meals, now only offering BOB. As none of the options are gluten free, we had prepared sandwiches ahead of time (and of course a jar of baby puree for Amy). 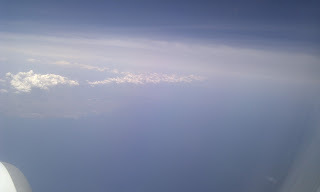 Our route crossed the Alps, and followed the Adriatic coast down towards Greece. 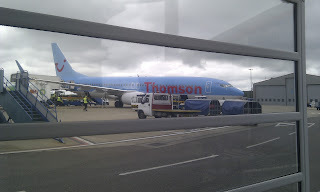 Somewhere near Croatia we spotted another Thomson aircraft, it looked like a 757. 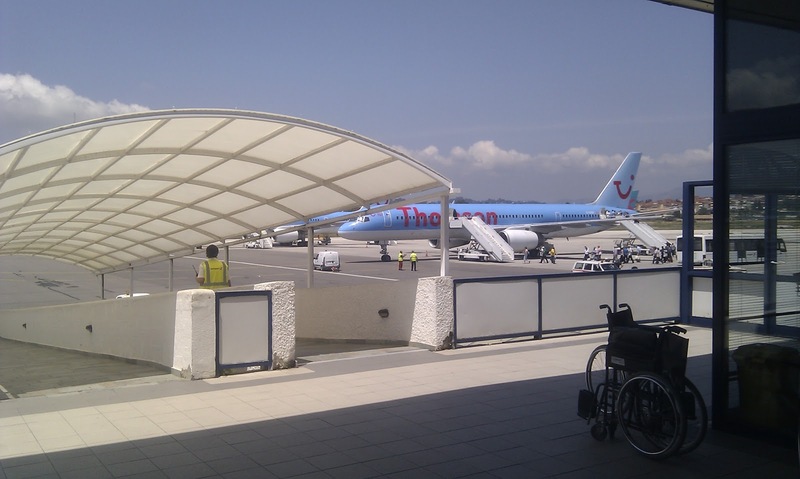 I'm pretty sure we saw the same one on the ground at CFU later, having arrived from Leeds or Manchester. Shortly after we started our descent. As far as I could judge from the aisle seat, and the aircraft banking movements, we flew southwards along the western coast of the island, before doing a 180 near the southern tip near the resort of Kavos, approaching the airport from the south. Even from my seat I could see some of the spectacular mountains, above our window level. 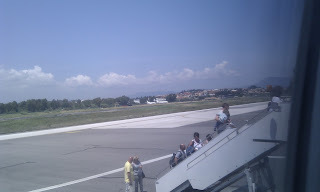 We landed with a bump and braked heavily - Corfu's runway is longer than NWI's, but still quite short, with a main road at one end and surrounded by sea water the other end. 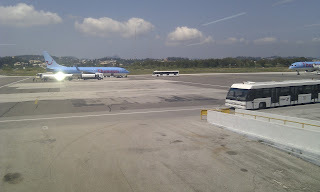 We pulled off onto the apron at a remote stand, and busses were waiting to take passengers to the terminal. The terminal seemed quite chaotic, and slightly run down. The busses dropped us at the bottom of a ramp, leading up into the building. Immediately inside was a bathroom, and passport control. The agents were both lax and strict - I waited for some members of our family to use the facilities, and could see sometimes the agents didn't even open some people's passports, but one woman who was also waiting for someone in the bathroom poked her head round to see if her luggage had arrived onto the carousel, was shouted at harshly. For us, a glance at our passports was deemed sufficient, and we waited inside for our luggage. By this time it had got dark. Eventually our bags came through, and we threaded our way past the other 2 planeloads still waiting for their luggage to the exit, found the agent for our apartments, and then got the keys for our rental cars. We had precise directions, and an hour or so later we arrived at the apartments, just near Acharavi on the north coast. We spent a lovely week there, there are some destination photos further down this report. On our last morning, we loaded the cars and headed back to the airport. After the long journey, we handed back the keys to the Europcar agent, and I had a look to see where to check in. 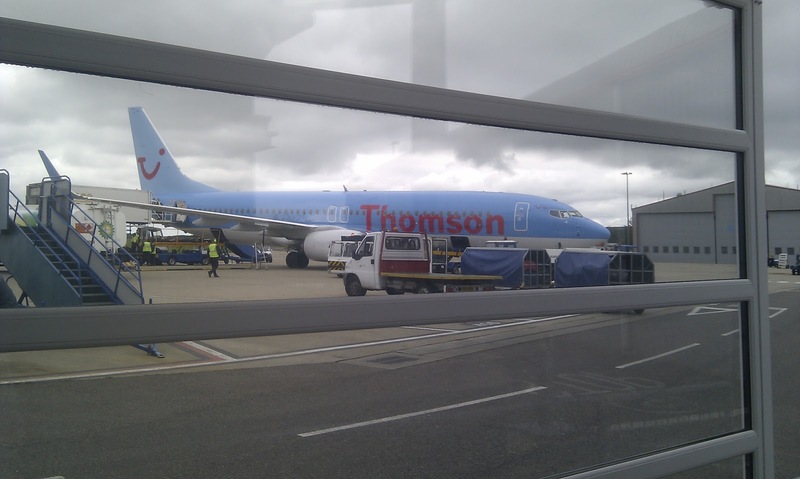 The Norwich flight was not yet checking in, a Thomson rep said that they had set up a queue outside (alongside a Glasgow flight), so that when our flight opened, they would bring in passengers to the small checkin hall. We found a seat near arrivals to wait a bit, and have a sandwich for lunch, again that we had prepared in advance. Then we moved outside, to join the Norwich queue. Soon the rep brought the 1st group of passengers inside to the 2 desks assigned for our flight. When we reached the front, we were checked in, our bags weighed, but none were taken - we had to take all checked bags to a side desk, where an X-ray was set up to scan them, from where they disappeared into the bowels of the baggage system. 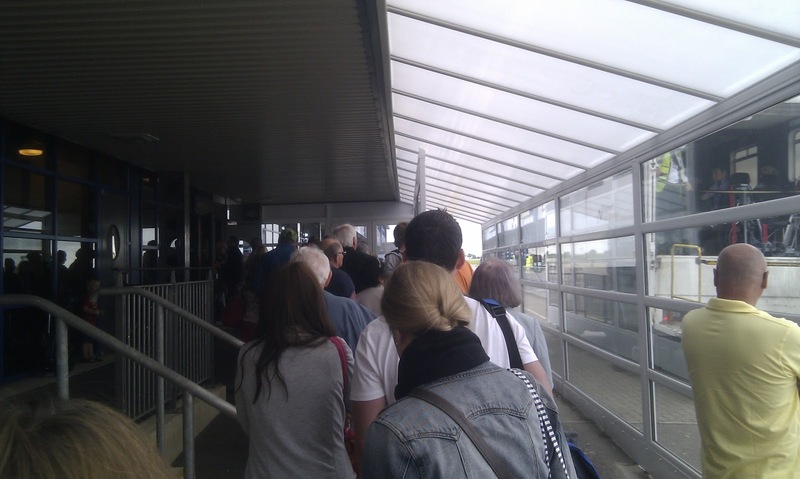 We then joined the security queue. Both children were very well be haved, it must be said. In these situations, certainly with Matty, a lollipop will keep him quiet for ages! 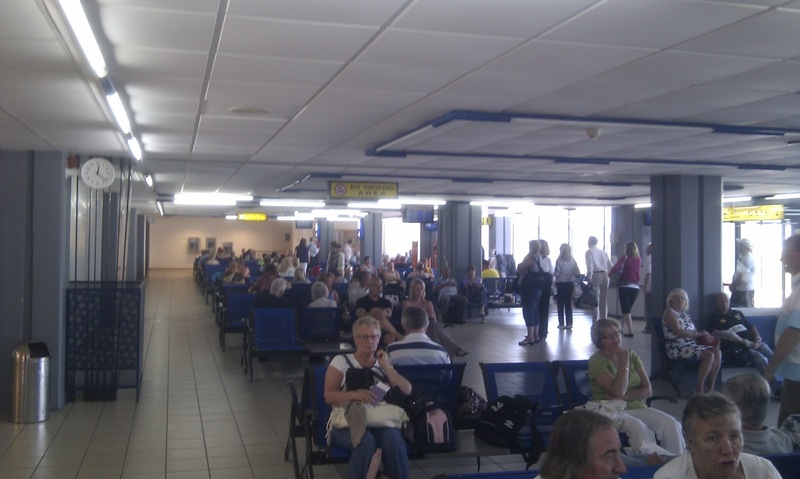 Through and to the departure lounge, were we found seats and ate some more. I went to the cafe kiosk to buy some water, and the guy there offered me a 500ml bottle - I asked if he had a larger one, he didn't but said "Take two!" So I asked how much, and was very surprised when he said "50c each". I wasn't sure, but he confirmed! Very cheap. Slightly mitigated by the EUR2.90 bag of crisps to go with them though! Apron view. This turned out to be our plane. As with the arrival, we boarded by bus. We had the same seat arrangement as before, only this time I couldn't give my camera to my mum to take photos as it was broken. So please note all return journey photos were taken with my phone (in flight mode of course!) We had rows 12 and 13 this time, so further forward. Again, like the outward flight, there were no empty seats. Even when everyone was seated, it took a while to take off. We had to wait for an arrival, then another departure to backtrack the length of the runway to turn around and take off northwards. Takeoff was powerful and we quickly climbed over the height of the surrounding mountains. 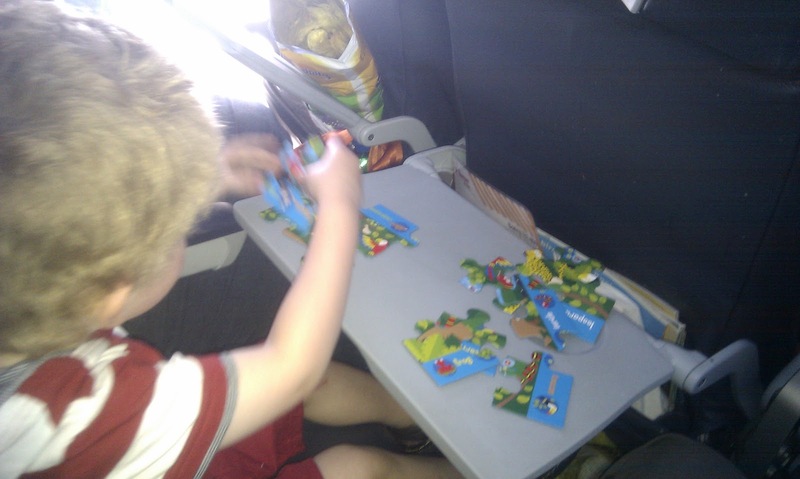 Once we levelled out to cruise, we got some toys out for Matty - he loves doing jigsaw puzzles. He had been making his way through a bag of Haribo gummy bears on takeoff, to enable his ears to adjust. Amy drank some water from her bottle. We followed much the same route back, as far as I could tell, only this time as we were on the left we could see the Italian coastline. Unfortunately clouds took over before we got to Venice. After an hour or so of the 3 hour flight, the children were getting restless, as it was later than their normal afternoon nap, so we snuggled up Matty as best we could on his seat, Amy in the sling on my wife, and they slept, or rather dozed, until the announcement came that we would shortly start our descent. We flew over Rotterdam and the North Sea, heading inland over Norfolk before turning to approach from the west. Again, we landed with a bump, and braked hard, before turning and backtracking to the taxiway off the runway to the apron. We disembarked, unfortuantely this time the pushchair would apparently be placed onto the luggage carousel with the bags. This was a shame, as we'd then have to carry the children through the immigration queue - they are much stricter in the UK than some other places, all passports are scanned and recorded. 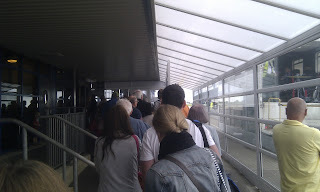 The queue for the border control filled the small room, and outside under a temporary, bus shelter-like cover. We had waited to get all our stuff off. As we left the plane, Matty said to the pilot, "Thank you driver!" completely unprompted. Very polite, though I don't know what the pilot thought of being called "driver"! When we take the bus, it is normal to thank the driver, so that may be where he got it from. Whilst waiting still outside, we saw the ground crew bring the pushchairs to the nearby door to get loaded onto the baggage carousel, so we asked if we could take it here. This was ok, so we laid the dozy Amy in her part of the double pushchair (a Phil and Ted's Explorer) and Matty sat on the top seat. Finally through border control, we picked up our cases, and out to the taxi rank to get a taxi home. A lovely holiday, on a lovely island. One of my wife's favourite books, "My Family and Other Animals" by Gerald Durrell is set on the island, and several people have remarked on it, so I have been reading it too now we are back. I only had one day at home before the Berlin meeting on the Sunday. Our apartments are the two ground floor ones, middle and right side. One day we took a trip to the Kanoni Peninsular. Here is a view of the island, and showing how close the airport is, in the rear view mirror. Matty eating fish. Mummy hates it so he won't be getting if often at home!